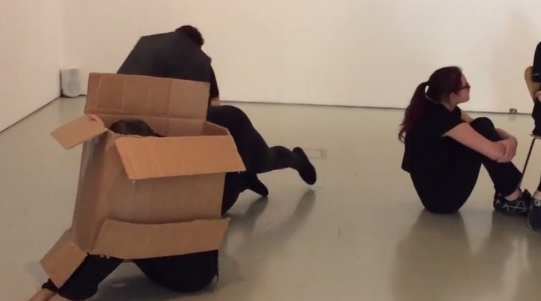 First and second year Performing Arts students at NPTC Group Newtown Campus respond to the ARTIST ROOMS exhibition of Francesca Woodman’s photographs at Oriel Davies– but using their bodies rather than a camera lens. Elinor Randle of Tmesis Theatre spent four days with them, helping them to devise scenes inspired by Woodman’s imagery and thinking in particular about the fragility of human nature; dealing with the expressive body, partner and ensemble work, play and improvisation. Working with lecturers Elizabeth Hebden and Ruth Calvert after these workshops, the students continued to develop their choreography into a single collective short piece for each year group. The aim was to "bring their physical narratives and Woodman’s photographs together at the gallery", as can be seen in this lunchtime performance. For more information, read the blog piece by Helen Kozich, Learning Officer (schools & colleges) at Oriel Davies.